Just came across POTUS Tracker, an interesting little tool from The Washington Post that lets you track what Obama emphasizes by how he spends his time in meetings. Apparently foreign policy and the economy are what he spends most of his time on, with health care only clocking in at place no. 5. (Hat tip to Pravda for finding this). Now that more information is available, it seems clear that calling the situation in Honduras a coup. Using the military to drive the president out and sending him into exile is hardly part of a legitimate judicial process. Steven Taylor had some good comments about that today. For that matter i recommend all his comments on the situation in Honduras. Daniel Berman and Thomas Rintoul of the Insitute of Iranian studies at the University of St. Andrews have analyzed the figures from the Iranian election. The report is published through Chatham House. They conclude that there is little doubt that the election was rigged to a degree that has decided the outcome. the greatest ‘swing’ in support towards Ahmadinejad. This is not the case. reformist voters, despite a decade of conflict between these two groups. Even in an unstable “democracy” such as Iran, it seems highly unlikely that such results could appear by coincidence. Of course this wasn’t unexpected, but it has become very hard for the Guardian Council to deny that there were irregularities. As the sham of democracy in Iran falls, we might see the regime losing even more of their popular support, which might turn out to become a catalyst for change in the long run. At the moment, however, it seems to me that the regime has the upper hand with its brutal treatment of the protests. Hat tip to Kai Arzheimer for posting on this report. I can’t yet find any English sources on this, but Norwegian newspaper Aftenpostenand the Swedish Aftonbladet report of events in France that don’t belong in any democratic country. A French blogger was reportedly arrested and charged with “public insults” after having called the French Minister of Families, Nadine Sorano a liar. “Hou la menteuse” – “O, what a liar” are said to be the exact words of 49-year-old blogger Dominique Broueilh. The newspapers claim that Sorano has also called for tighter surveillance of bloggers in general by Frenchs ISPs. No reason has been given for the refusal, but I can hardly see how it can be a positive sign for the Sri Lanka situation. Norway’s role as peace broker in Sri Lanka seems pretty much played out after Norwegian police failed to prevent damage to the Sri Lankan embassy in Oslo on the hands of Tamil protesters. The Sri Lankan government has reputedly declared Norway unwanted in the process. 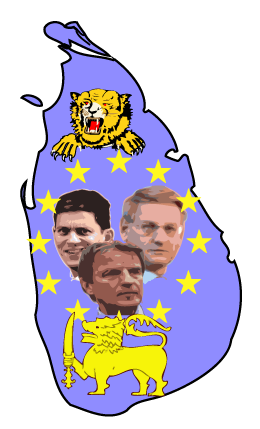 But according to Swedish foreign minister Carl Bildt’s blog, he is going to Sri Lanka to try and handle the humanitarian situation – together with French foreign minister Bernard Kouchner and their British counterpart David Milliband. It’s a real show of force from EU to apply pressure on the parts of the conflict to refrain from further bloodshed. It may also be a sign that the EU is really serious about its role as a global peace broker with a different focus than that of the US. The Tamil Tigers (LTTE) have according to various media already asked for a cease fire, but the Sri Lankan government has rejected it, demanding a complete surrender. AP now reports that Danish PM Anders Fogh Rasmussen is confirmed as new NATO secretary general, despite strong opposition by Turkey. It was not an easy choice for NATO, and carries with it a number of issues. Fogh Rasmussen is certainly controversial in many places. One of the big problems Turkey had with his candidature may be his involvement in the Mohammed caricature controversy, in which he supported Danish newspapers quite vehemently. He is also closely tied to former US president Bush and has been very supportive of the war in Iraq. This is understandably difficult for a Muslim country partially located in the Middle East. Fogh Rasmussen, a right-liberal politician, has also been controversial domestically. In 1992 he had to resign from his post as Minister of Taxation preempting a vote of no confidence for misinforming the Danish parliament. He is also known for his adherence to the liberal ideal of the minimal state and a preference for low taxes. On the latter point he has been criticized for not doing enough, but he has implemented a “tax freeze”, promising at the least not to raise any Danish taxes. The most controversial of his policies is arguably his government’s hard-line stance on immigration, by many accused of bordering on the xenophobic. Fogh Rasmussen has also made a name for himself as a strong EU supporter, and has reportedly been considered for several positions in the EU leadership. He has however run into many problems on home ground during his years in the Danish cabinet, with Danish rejection of the Maastricht Treaty, the Monetary Union and most recently opposition to the implementation of the Lisbon Treaty. The biggest challenge for NATO is however likely to be that many leaders in the Muslim world still connect Denmark and Fogh Rasmussen with the controversy over the Mohammed charicatures – a connection that could now spill over more strongly to NATO, giving more fuel to Muslim leaders that benefit from portraying it as an anti-Muslim alliance. It’s been in the works for quite some time, but Malaysia’s unpopular prime minister Abdullah Badawi (nicknamed Pak Lah – “uncle Abdullah”) finally handed in his resignation to the Malaysian king yesterday. He will be succeeded by his deputy prime minister and successor as UMNO party president, Najib Tun Razak. After UMNO has been losing ground over the last few years, in 2008 in particular, the challenges for Najib will be great. 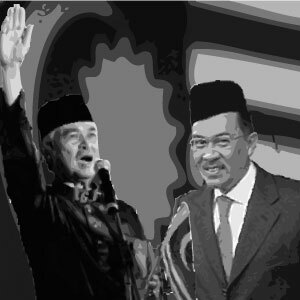 While Malaysia is being hit harder and harder by the international financial crisis, Najib will have to reform and revitalize his party, the Barisan Nasional coalition and the government of Malaysia itself if he is to have any hope of holding the opposition coalition under the leadership of Anwar Ibrahim at bay.